It’s official. 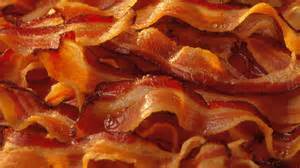 Bacon is epidemic in the U.S. It is not inconceivable that the two are related. 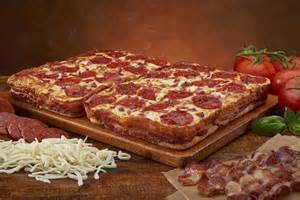 I can blame my friend who drew my attention to the world of evening TV commercials for my new-found amazement and bacon-fueled outrage. If it weren’t for him, I would have remained blissfully ignorant, bouncing out of my chair for every commercial break to putter about with minor chores like dishwashing or reading mail. But now I stare, saucer-eyed, at the endless parade of sizzling, fat-striped temptations. First, one I’ve already mentioned in a former posting. 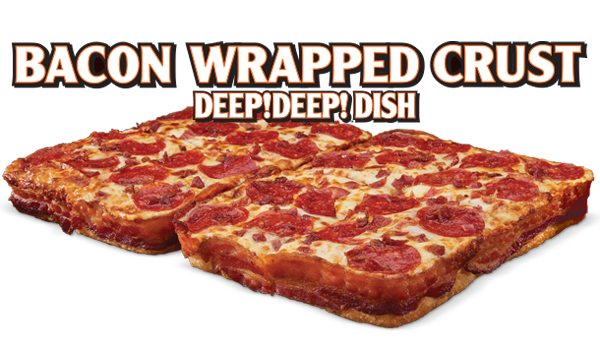 The forerunner of the lick-a-pig deluge: Little Caesar’s deep dish bacon-wrapped crust pizza. 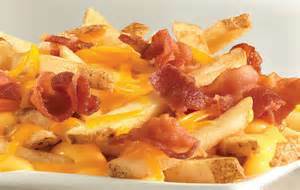 Wendy’s Baconator Fries. Like deep-fried potatoes aren’t bad enough, this little culinary artery-clogger boasts the traditional bad-boy French fries smothered with melted cheese and lots and lots of bacon. 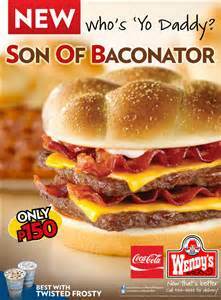 The Baconator fries are intended as accompaniment, a companion side-dish to…wait for it…the Baconator and/or the Son of Baconator! I despair for our national health. The only thing I can say on the positive side is: faced with a choice between any one of these grease-monsters or a doughnut containing Ariana Grande’s spit…I’d have to choose the grease. 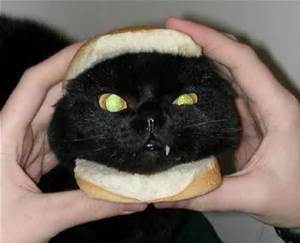 The world of fast food has become a very scary place. Something about the lazy rhythm of a heat wave and the unexpected adventures it can bring. But then…this! 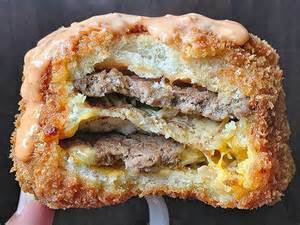 It’s a deep-fried Big Mac drizzled with extra ‘secret’ sauce, which I think is another name for Russian salad dressing, and I decided the only response that made sense, other than retching and dry heaves, is another Lean Cuisine Salad Addition Wannabe: Cranberry and Chicken. Nestlé does not sponsor, authorize or endorse my blog or these recipes. It’s not like they hate me, but if they saw me on the street, they’d pretend to be very interested in a window display until I’d passed. With each of these forays into Salad Addition Land, I learn something. That’s not as remarkable as it might sound, because what I know about cooking wouldn’t fill a thimble. 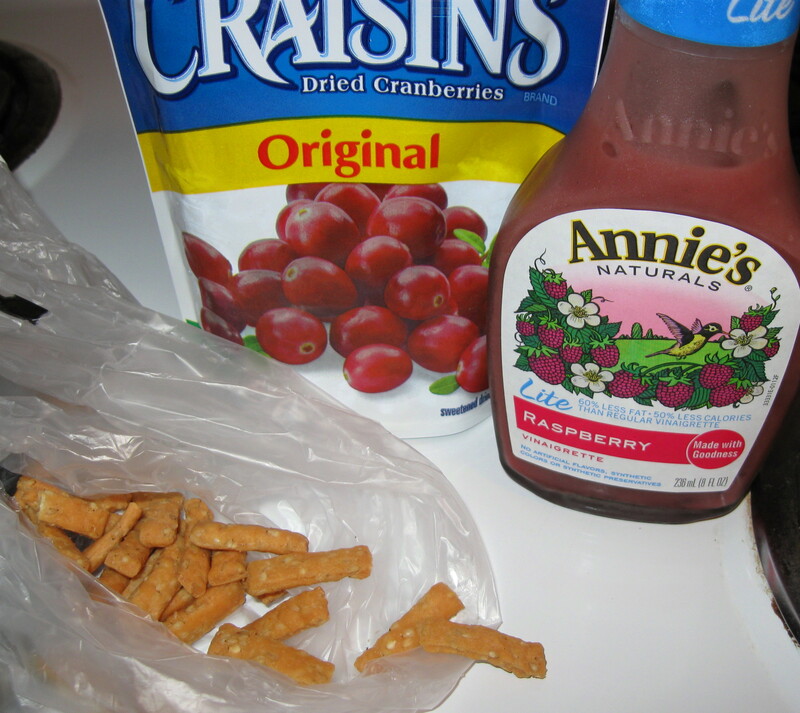 But Cranberry and Chicken proved a bit problematic for one reason: the sesame stick croutons. I searched through store after market after outlet. When sesame sticks couldn’t be found among the crackers, or the croutons, or the snacks, I found a substitute I thought would be perfect. 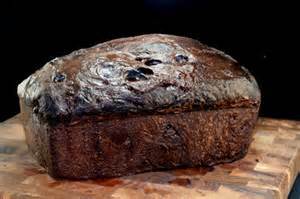 Billed as a new topping for salads (which gave me great hope), it contained dried cherries, grains, and granola. Since one of the ingredients Lean Cuisine used to tout for Cranberry and Chicken on the packaging was ‘a blend of grains,’ I thought it was a no-brainer. Perfect! It became quickly obvious that this salad required a savory, salty embellishment. The dried cherry thing tasted more like a breakfast cereal. 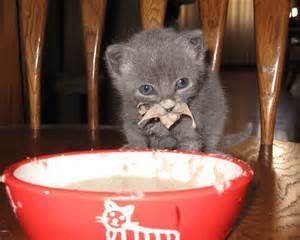 In fact, I ate it the next morning with milk. And then…Eureka! Wandering disconsolately, I discovered the buy-in-bulk section of a large market. Hidden among the jelly beans and raw almonds were…sesame sticks!! I bagged my quarry and trotted home, triumphant. 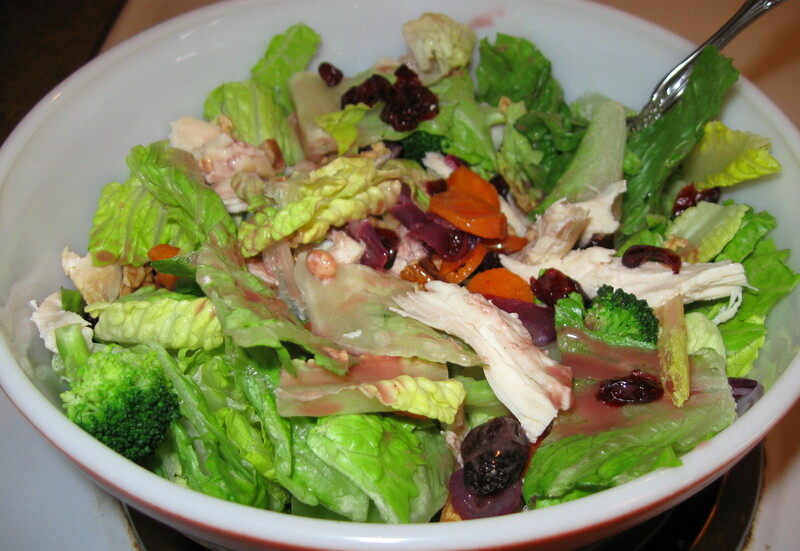 So, Lean Cuisine Salad Addition Cranberry and Chicken. Put the cranberries, onion, carrots and broccoli into that microwave-safe bowl that’s getting a lot of use in these recipes. Cover. Nuke on high for 2 minutes 30 seconds for an 1100 watt oven. Adjust time up or down depending on your microwave’s wattage. While the toppings are cooking, prepare your lettuce. Toss with the cooked chicken breast and the nuked ingredients. Drizzle with the dressing and add the sesame sticks on top. It’s a sweeter salad than the others in the Lean Cuisine line, but the salty sesame sticks and the piquant onion save it from being cloyingly so. As with the others, you can set up a little kitchen factory and dump the chicken, cranberries, carrots, broccoli, and onion into freezer baggies. Then, when the mood strikes, empty the baggie into that bowl that’s becoming your single most-used dish, cover and microwave 2 minutes, 30 seconds. 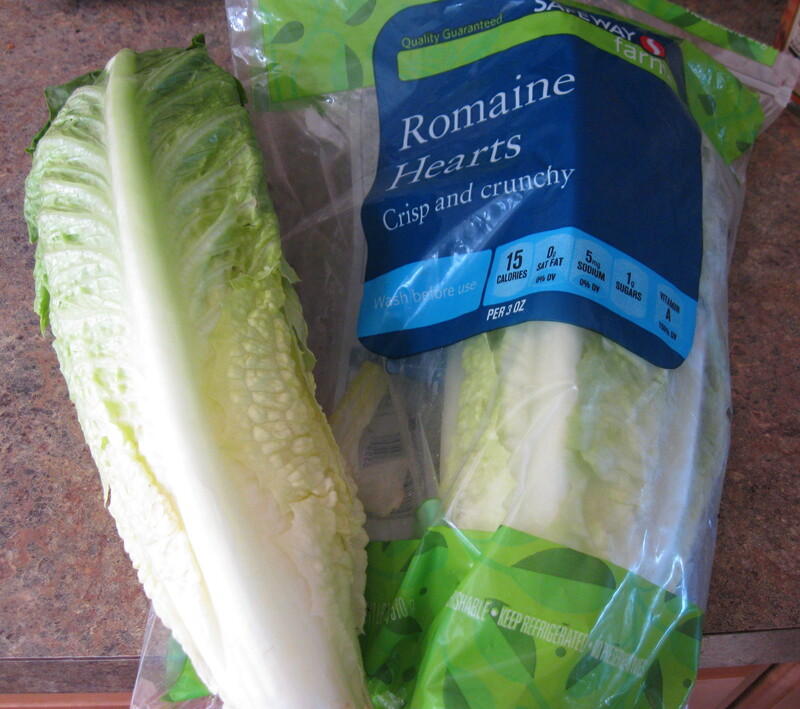 Add lettuce, dressing and sesame sticks. 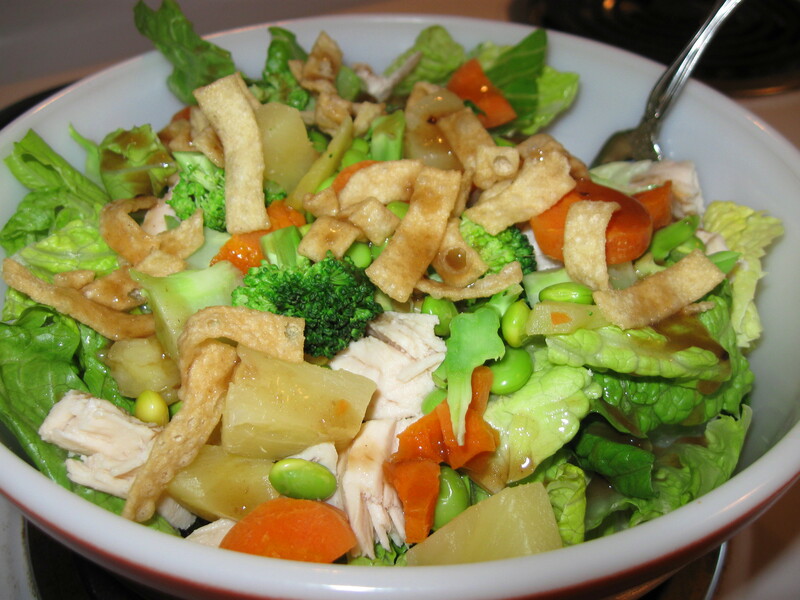 Now, let’s move on to my second favorite Lean Cuisine Salad Addition…Asian Style. I’m tweaking the ingredients a little to make it easier for non-cooks like me who shop in normal, everyday, un-gourmet markets. 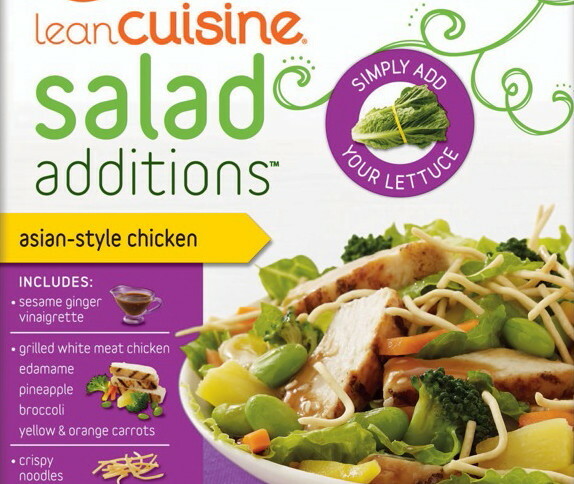 This is an adventure for me, because I start each quest by searching for the same things Lean Cuisine used to list as featured ingredients on their Salad Addition packaging. For instance, Asian Style touts both yellow and orange carrots. After a long and arduous hunt, I did find a store that sold small bags in the produce section labeled ‘Rainbow Carrots.’ There were indeed yellow ones tucked in amongst the orange, an unusual reddish version, and a rather bleak-looking grayish-blue. And they were quite pricey. So my Asian Style facsimile will use only the trusted and beloved orange carrot you can find anywhere. The same went for the crispy noodles that Lean Cuisine uses in lieu of croutons. Sure, there are crispy noodles in the Asian aisle. You know, the aisle that also has Mexican, Italian, Indian and Kosher, with a sprinkling of exotica from other nationalities, like the British treacle. (Still not sure what treacle is, but my mind conjures visuals that are best left unexplored.) Anyway, the noodles I saw were too thick and heavy. 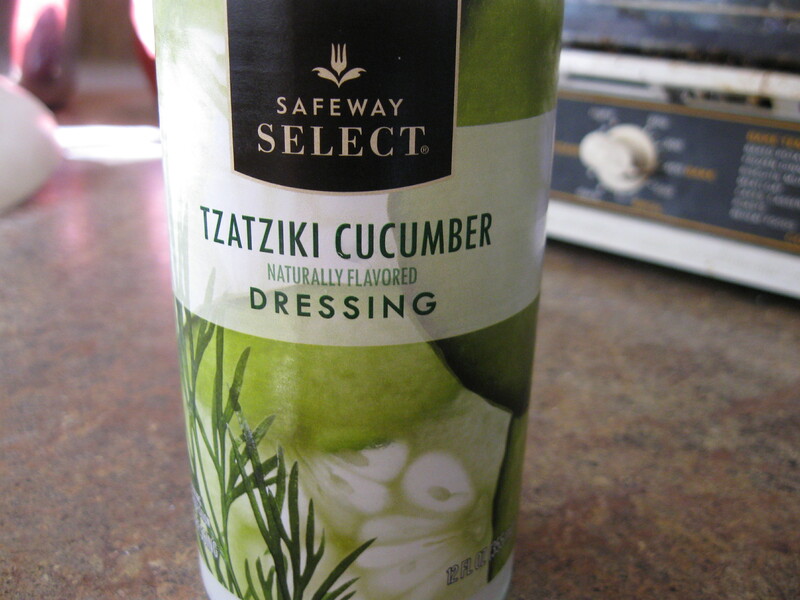 So I chose something from the salad dressing aisle where croutons and toppings reside. Crispy wonton strips. Put the pineapple chunks, frozen endamame, carrots and broccoli into your trusty microwave-safe bowl. Cover. Nuke on high for 2 minutes 30 seconds for an 1100 watt oven. Adjust time up or down depending on your microwave’s wattage. While the toppings are cooking, prepare your lettuce. Toss with the cooked ingredients. Drizzle with the dressing and add the wonton strips last. Voilà! A really tasty Asian style salad that gives the extinct Lean Cuisine version a run for its money. This recipe clocks in at 263 calories as compared to Lean Cuisine’s 260 calories. Good enough. If you set up an assembly line type production, you can put the cooked chicken, pineapple, endamame, carrots and broccoli in freezer bags. For a convenient, healthy, delicious meal days or weeks later, empty the contents of the freezer bag into your microwaveable bowl. Cover. Cook for 2 minutes 40 seconds for an 1100 watt oven. Then add to the lettuce, dressing and wonton strips. 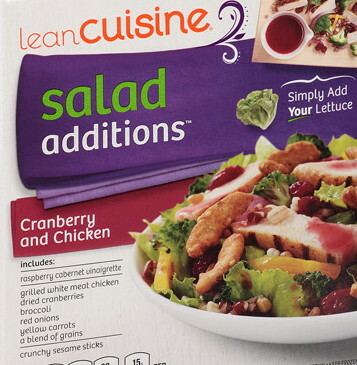 Next up: the Lean Cuisine Salad Additions Cranberry and Chicken! Nestlé does not sponsor, authorize or endorse my blog or these recipes. They told me so. 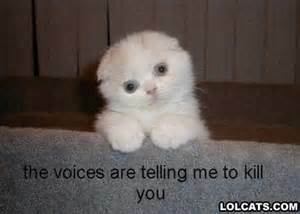 And said I better make that very clear on each and every blog about them. The kitchen is not where I belong. So when I find something convenient and palatable that takes a minimum of prep time, I stick with it. 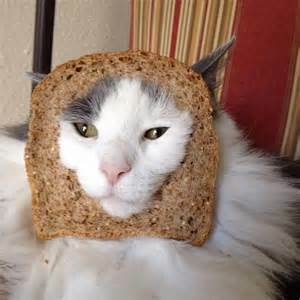 I embrace it. 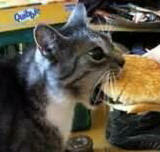 I engulf it. It becomes my staple. So it was with Lean Cuisine Salad Additions. I searched the local market for a year. Gone. No more. Finally, I contacted Lean Cuisine themselves and asked what had happened. They replied that the sales didn’t justify the shelf space. In other words, people would rather buy gummy entrees like macaroni and cheese, or ones that imitate their unhealthy cousins, like beef steeped in sour cream, than make a salad. I’m not surprised. My outrage for the eating habits which the advertising and food industries encourage continues to grow. 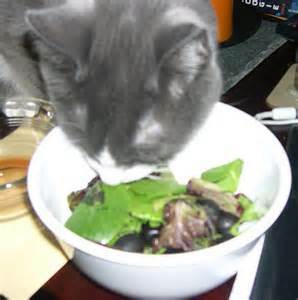 But I loved Lean Cuisine’s Salad Additions. So I determined to enter the foreign territory of the kitchen and see if I could duplicate them. 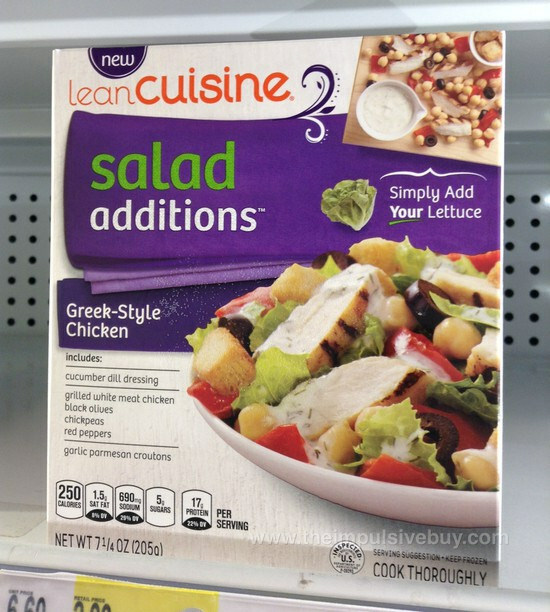 I contacted the Lean Cuisine folks again and asked them if they’d mind my blogging the simple, tasty recipes for those who miss Salad Additions. They replied that my request had been sent to the appropriate department. That’s where it ended. I haven’t heard back and I can’t blame them. If the product wasn’t profitable, why would they waste time responding to inquiries about it? That’s not good business when the bottom line isn’t health, but profitability. So I’m posting the first of my favorite recipes for anyone who wants to fill the gap Lean Cuisine left wide open. You’ll need a small, kitchen scale you can get at most grocery stores, and a microwaveable bowl you can cover (I use a microwaveable plate as a cover). This is my replication of Lean Cuisine Salad Additions Greek Style. 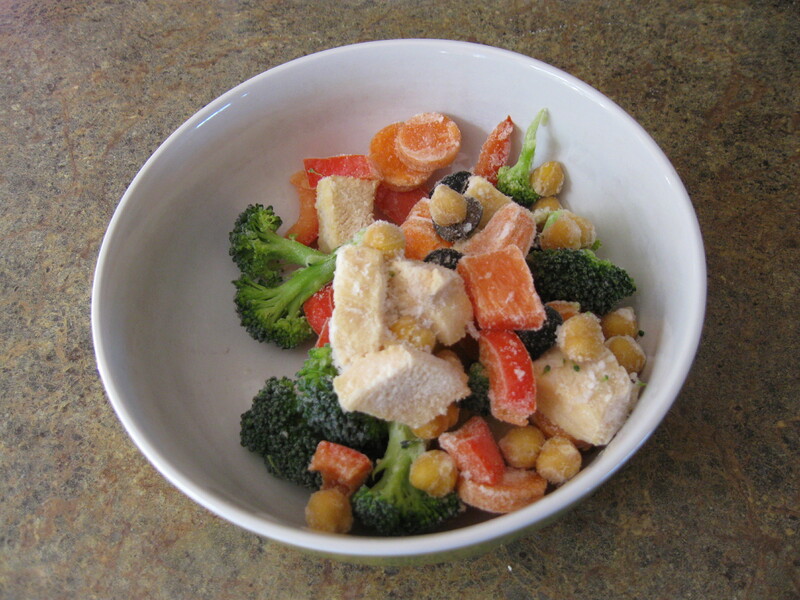 Place the olives, garbanzo beans, carrot, broccoli and bell pepper in the microwaveable bowl. Cover. Microwave on high for 2 minutes, 15 seconds for an 1100 watt microwave oven. Adjust the time up or down a few seconds for different wattage. While it’s cooking, put your lettuce in a bowl or on a plate. Slice the chicken meat. Toss the lettuce with the chicken and the microwaved veggies. Top with the cucumber dressing. 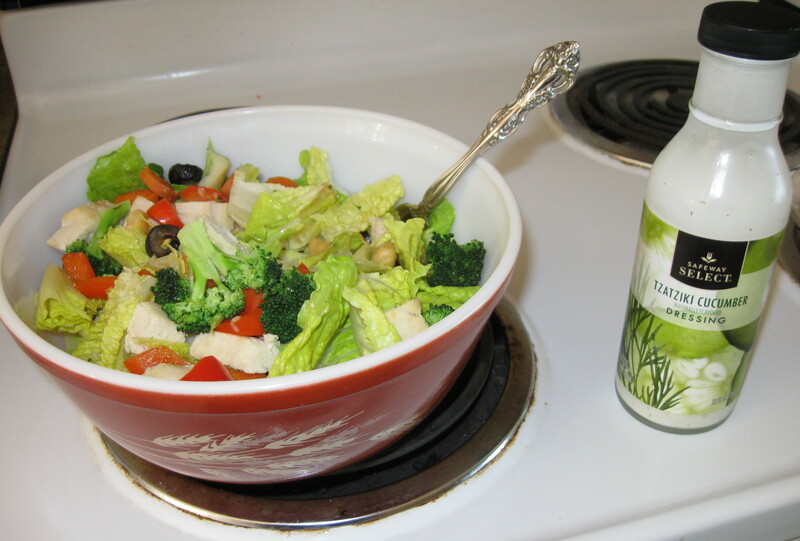 The salad toppings and dressing weigh in at 240 calories. It’ll taste delicious. You won’t miss Lean Cuisine at all. After doing this twice, I was comfortable enough to make several servings at once. 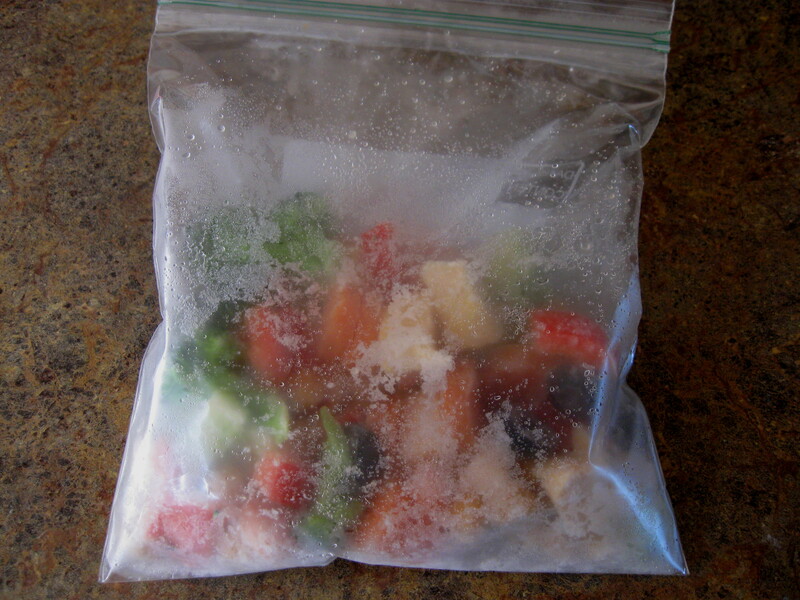 Put the veggies and chicken in freezer bags; one serving per bag. Whenever you want a healthy salad, empty the chicken and veggies into that microwaveable bowl, cover, and heat for 2 minutes, 30 seconds. 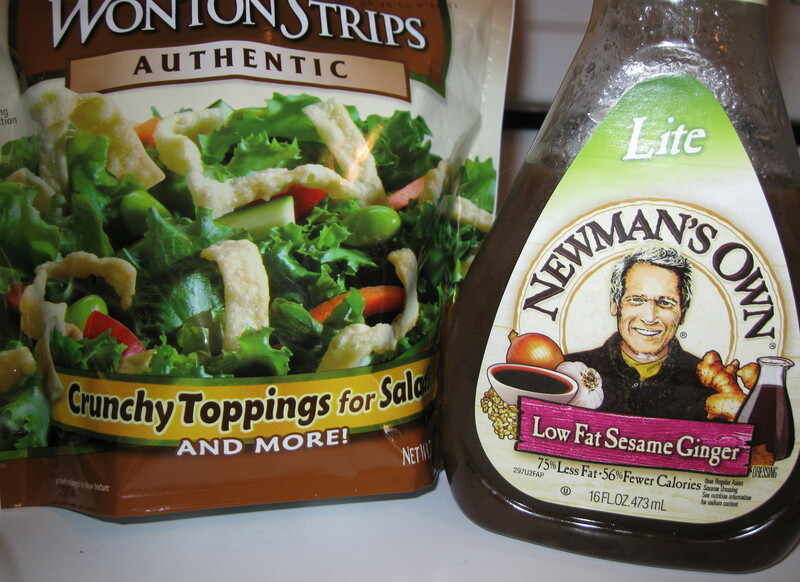 Add your lettuce and dressing and thumb you nose at the food industry. If you do go the freezer route, it’s best if the chicken isn’t overcooked when you broil or grill or bake it. If you do overcook it’ll just be a little tougher texture than otherwise when you microwave the frozen meat. It’ll still taste great, though, in my opinion. So, from a non-cook who’s outraged that the salad was discontinued and an ad just popped up on TV for a burger layered with a hotdog and potato chips…and the reason given for this revolting concoction is “Because…AMERICA!” ….bon appetit!